Most of the questions I get from my facebook pals have to do with how to choose a shampoo from the lot. With the kind of attendants at most cosmetic shops in our markets, it is always safer to know the exact product you are looking for (see an encounter in Gossip Train5#Shopping Time). From what I've learnt, depending on your hair needs, there are several considerations in the choice of a shampoo. I will discuss two categories; choice based on component/ingredient and selection based on purpose/function.We are going to use a bit of science so buckle up! studies showing that long-term sulfate use can lead to damaged hair follicles, hair loss and hair breakage. Let's just say that when you pick up a shampoo, look out for these ingredients. Key them unto your phone and scan through whenever you chance upon a shampoo! 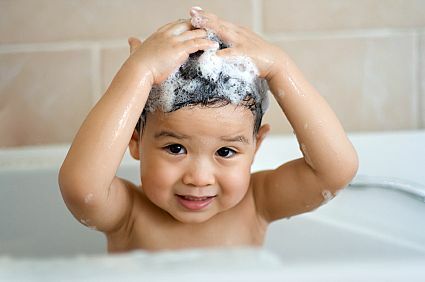 The misconception we have about shampoos is that the more it foams, the better it works. Most of the shampoos I use have the harsh surfactant (now I know better). I combat the effect through diluting with water or wetting my hair thoroughly so it can be easily be distributed through the hair. When you have to use more of the shampoo to get more foam, you only expose the hair to the drying effects. For my ladies who use bathing soap to clean their hair(yes, you), you are now aware of the harm you are doing to your hair. If something meant for the hair can be dangerous, how about what is meant for your soap bowl? Whew! Enough for today. In the next write up, we'll focus on the classification of shampoos based on their purposes. Visit Products page for a list of some sulfate free shampoos you can use. Nice post and thanks for referring to my post!